AMARC Experience - What is AMARG? 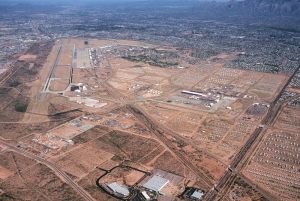 AMARG, or the 309th Aerospace Maintenance and Regeneration Group (previously known as AMARC, the Aerospace Maintenance and Regeneration Center), is a joint service facility managed by the US Air Force Material Command located in the city of Tucson, Arizona, USA. 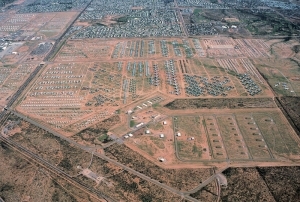 Often referred to as 'The Boneyard', AMARG is an aerospace storage and maintenance facility adjoining Davis-Monthan Air Force Base which provides a service to all branches of the US military (Air Force, Navy, Marines, Coast Guard and Army), as well as other national agencies. Typically controlling over 4,200 aircraft as well as many other types of military equipment, AMARG works very hard in promoting itself as not just a 'Boneyard' and takes every opportunity in explaining how it operates its cost effective, tax saving operations. Many of the stored aircraft can be returned to an operational status in a short period of time and there is a continual process of anti-corrosion and re-preservation work which keeps the aircraft in a stable condition during their stay. 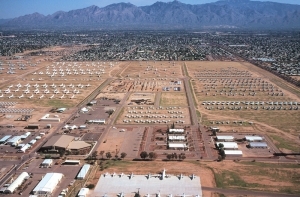 Description: Davis-Monthan AFB and the west side of AMARC. © AMARC Experience. Description: The Wash Rack and some of the long term storage areas on the west side of the facility. © AMARC Experience. Description: The east side of the facility where the RIT areas are located. This picture is looking towards the north. © AMARC Experience. 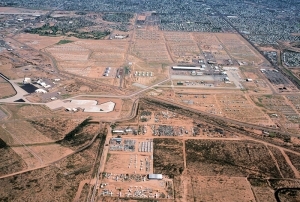 Description: Picture showing Davis-Monthan AFB, the west side of AMARC and the scrapyards on South Wilmot Rd. The reason the Boneyard reference exists is due to other work that AMARG carries out, that of reclamation of spare parts and the eventual disposal of spent airframes. The facility can be divided into two distinct areas, the RIT (Reclamation Insurance Type) area located to the east side of Kolb Road is littered with aircraft in various states of completeness. The junkyard appearance belies the fact that these aircraft are controlled by a process of careful part reclamation, both to a schedule and to ad-hoc requests. On careful examination many of these aircraft can be seen re-sealed to protect the remaining components from the dirt and heat. There are many times that aircraft from the RIT area leave AMARG to become instructional aircraft, targets on Army or Air Force ranges, museum exhibits or display pieces, although most end up being smelted down into ingots by nearby metal processors. Over the years AMARG has also been heavily involved in the elimination of B-52 Stratofortresses under the Strategic Arms Reduction Treaty and were also responsible for the eliminiation of 445 Ground Launch Cruise Missiles (GLCM) and their launchers under the INF Treaty. In more recent times AMARG has become more involved in depot repair, maintenance and modification work on types such as the A-10 Thunderbolt and C-130 Hercules. Of particular note is AMARG's work on the A-10 "Hog Up" program which is expected to extend their life in the Air Force fleet to 2028, and the commencement of Programmed Depot Maintenance (PDM) overhauls of C-130s, the first of which was completed on February 20th, 2009. Another example of depot-level maintenance was the mandatory checks and repairs that AMARG carried out to 84 A-10 following the discovery of wing cracks in the fleet at the end of 2008.